THE GOVERNMENT has been working toward making gender equality and women empowerment a norm in the workplace, according to Sen. Risa Hontiveros, who chairs the Senate Committee on Women and Gender. She announced this at the recently concluded business forum organized by the European Chamber of Commerce of the Philippines (ECCP), saying also that entrepreneurs have been supporting government to push for laws and programs for women empowerment. Expressing delight at how the forum had attracted interests among the different business industries, Lobien said more than 100 female managers, supervisors, and employees, as well as executives and leaders from the private sector, government, and academe came together for a freewheeling discussion on issues concerning and affecting women in workplaces. “The forum was also a celebration of collective achievements and progress by women — and even men — in promoting gender equality in our places of work,” she added. The president of Mageo Consulting, Inc., Boots Garcia, for instance, highlighted the advocacy for women’s rights in workplaces as having a significant impact on the economy, while Myrna Yao, CEO of Richprime Gobal, Inc., talked about the need to embed gender-equality practices in every organization, as this brings about improved productivity. 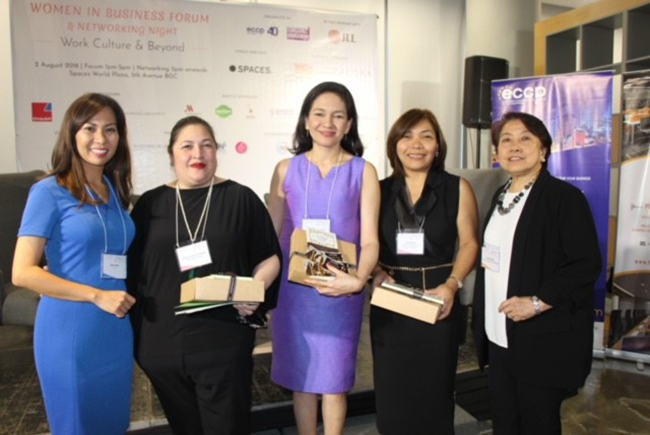 While the forum hosted a number of plenary sessions as well as moderated discussions on a number of topics about women in the workplace, one of the highlights was the need to bridge the gap between businesswomen and female millennials, who themselves are expected to someday become entrepreneurs or productive members of society.